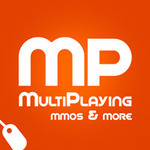 We've recently cancelled our hosting for the audio episodes of Multiplaying. This means that you can no longer download them on iTunes or Stitcher or wherever it is you get your podcasts from. But that's so sad! What about those times you want to wallow in the good old days? Well, we've found a solution... sorta. We've put them all on youtube. MOST of them are just terrible slideshows that have nothing to do with the content of the show, or maybe they're just a bunch of logos, but the audio content is there. I am happy the shows are on YouTube. Archive.org would also be a good hosting solution. I am partial to the Creative Commons, BY-NC-SA license, which basically means the shows would remain free to everyone, but credit is given to the creators and the show must remain free if redistributed. I am sorry that I am not signed up for the new forum, but I am suffering from sign-up fatigue.